When you follow politics and the news like I do, you often become pessimistic and cynical, believing that the world is going to end every single week. Your perspective changes so much that often you lose the little joys in life and human interaction. 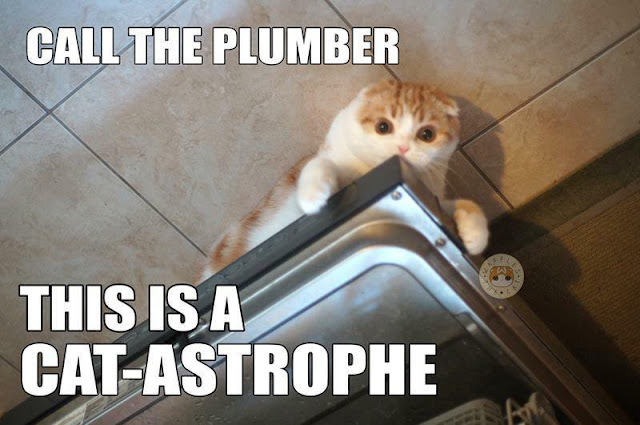 So, below is a story about a plumber that I found from the interwebz. If you had a bad day, just remember that it could always be worse. When my grandfather was young he owned a roadside motel, and my mother used to do work around the motel for the family. The building was old and they had bad pipes, so visits from the plumber were a fairly regular occurrence over there. At one point they had a clogged toilet after a guest checked out, so they called the plumber to come and clean it out. The plumber came in with his bag of gear and set to work, but the clog was stubborn. After a few tries, he decided he needed to get the snake. I don't know if you've ever seen a serious plumbing snake, but the big ones are a sight to behold. This isn't a little crank auger, it's a full-on electrical powered snake with a big motor on the back and a little grabby claw on the end. So he fires up the snake and sends the metal coil down into the pipes with the claw closed, figuring whatever's down there he'll just bump it a bit, push it down the pipes until it clears - but this doesn't happen either. Finally, in frustration, he twists the control to open the mechanical claw at the end of the coil, closes it on something, throws the motor in reverse and starts to pull it back up. By now a couple of members of the staff have gathered in the room to try and figure out what the hell got flushed down the toilet that this giant machine couldn't remove. The motor is really straining - you know that sound an electric motor makes when it's working really hard? The whole machine is struggling to pull whatever this is back up through the pipes and into the room. Finally, after an extended wait, the object is slowly dragged, sopping wet, out of the toilet bowl - and it's a shower curtain. The staff is dumbfounded. They're trying to figure out how this could have happened. It would be weird enough if the guest had ripped the shower curtain down and flushed it down the toilet, but the shower curtain in the room is still there. It would be even weirder if the guest had brought their own shower curtain to the motel and tried to flush it down the toilet, but it's clearly one of their shower curtains. Did they try and steal the shower curtain, leave with it, then feel guilty and come back only to find that the shower curtain had already been replaced, and then flush the shower curtain down the toilet to hide the evidence? The snake had missed the clog entirely. Rather than spiraling down into the plumbing where it was intended to go, it had wound its way into the central line, and then back up the pipes in the room next door. It spiraled its way up, out the toilet bowl, and then started flailing wildly around the next-door bathroom like a Lovecraftian nightmare made of steel, knocking things off of shelves and clattering furiously around the room. Then, while the hapless housekeeper watched in horror, a metal claw opened on the end of it and snagged the shower curtain, ripped it off the bar ring-by-ring, spun it around the room until it was coiled tightly around the cable, and dragged it back down into the toilet bowl. The actual clog was never found.